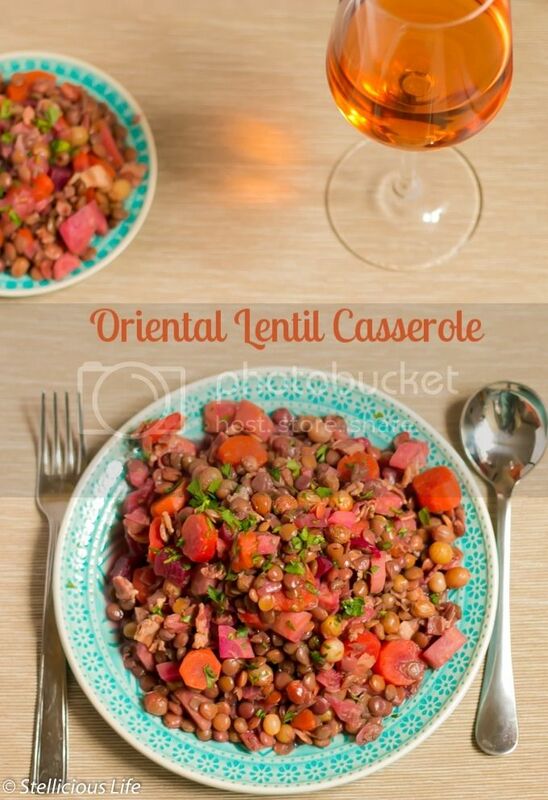 Make this oriental lentil casserole with bacon, carrots, beets and raisins, and sprinkle it with cinnamon for an unusual but extraordinary flavour combination. In many cultures lentils (and peas) symbolize abundance and fortune, therefore one must eat it at the beginning of the New Year to ensure their own and their family’s prosperity in the year to come. Due to this tradition my family’s obligatory lunch on January 1st always had lentil soup. Which as a kid I hated. My sisters and I tried to boycott my mom’s lentil soup, but the responsibility of the whole family’s fortune resting on our eating a bowl of lentil soup was too much, so we grumbled but ate it. Thankfully my mom heard our complaints and experimented with other dishes containing lentil and that’s how this oriental lentil casserole entered our lives. It was instant success the first time she made it: not just us kids, but my dad as well asked for seconds. To this day it’s a favourite in our house, and my mom never has to listen to me or my sisters grumble about having to eat lentil anymore.